What do you pledge to do for Zero Waste Week? We help householders, businesses, organisations, schools, universities and community groups waste less with our range of products and services. We provide eye catching display materials, lesson plans, downloadable guides, online courses, talks, workshops, consulting and the award-winning week-long annual awareness campaign, to help you reduce waste, save money and preserve resources. Join us today and be part of the solution! We'll supply an all-day stand or lunchtime talk in your organisation. Perhaps you want an after-school club or a morning assembly for your school. Or how about a Saturday morning workshop in your local cafe? You'll leave with inspiration and motivation. If you need done-for-you social media updates, display materials or comprehensive guides we’ve got packages to suit everyone. And if we don’t have it, we’ll create it for you. Everything we do is designed to engage, excite, empower and educate. We'll supply your business with consulting to help you save money, achieve sustainable goals and enhance your CSR. We can visit you onsite or you can take advantage of Skype meetings - saving you time and money. 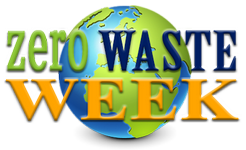 Zero Waste Week is an award winning annual awareness campaign that helps participants save money and preserve resources. Sign up to our newsletter to get daily emails throughout Zero Waste Week. You'll also receive quarterly mailshots with interesting news, hacks and resources to keep you on the path of being a waste warrior! Sign up to our newsletter to get daily emails throughout Zero Waste Week. It's free to take part! Family in Gloucester reduce their waste from 12.5kgs to 800gms in a fortnight! © 2008-2019 Zero Waste Week. All Rights Reserved.